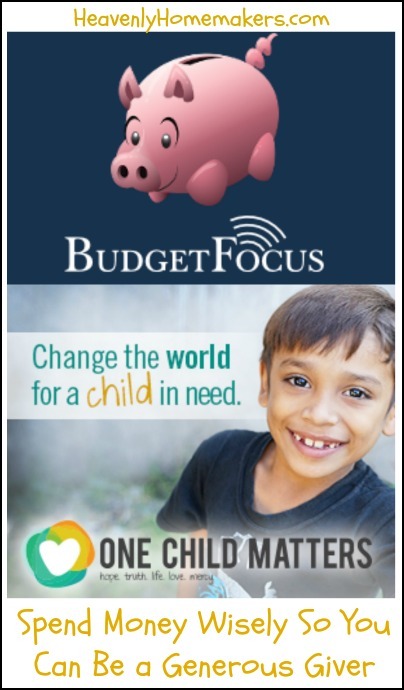 If you’ve hung around here much, you’ve heard me sing the praises of both Budget Focus and One Child Matters. They are two very different organizations, focusing on two very different needs. I believe they are both very important and different as they are, I believe the two fit together perfectly. Budget Focus is a site created to help you get your finances in order. They help you set up a budget, spend only the money you have, avoid debt and climb out of debt, and find financial peace and security. What does that have to do with One Child Matters? Well, when you know where your money is going and how to wisely use your money, you are much more able to put your money toward important needs like One Child Matters. I love One Child Matters for all the efforts they make toward loving children. I love that they work so hard to care for the needs of children. And I love that you and I can so easily be a part of this ministry. Obviously, getting your finances in order means you can use your money in great ways that go beyond helping meet the needs of children in other countries. There are local needs all around each of us, our own family members and church family members have needs – there are many, many needs. One of the biggest blessings of being financially secure is that you are then much more free to give! I encourage you to consider One Child Matters as one of those opportunities. Our family has been so blessed by our sponsorship to our little girl, Gladis. If you’re in need of an online source to help you get your budget on track, please consider Budget Focus. This month, they’ve knocked down the price of their annual plan to make this possible for everyone! How have you found budgeting to be helpful in your efforts to be a generous giver? I think that, as good stewards of what God has given us, it is important for us to make wise financial decisions so that others can benefit. Mother Teresa said that we should “Live simply so that others may simply live.” There is no harm in going without something once in awhile so that others can have the basics that we often take for granted. Thanks for the reminder to share our blessings!